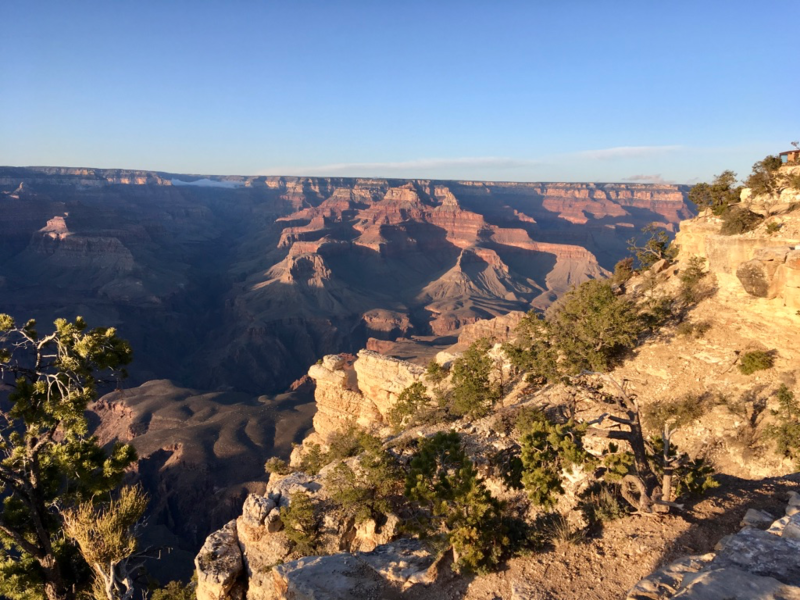 From April 15-21, 2018, our family took Bindlestiff Tours’ 7 day Southwest USA Highlights camping tour. My girls were 8 & 10 at the time. The tour started and ended in Las Vegas. We decided to go with a bus / camping tour as I thought this would be a good way to introduce my girls to tent camping. Bindlestiff provided the tents and sleeping mattresses, as well as all the kitchen equipment. All we needed to do was bring our sleeping bags, clothes, and toiletries and help with camp set up and take down. This is the van we rode in. It was fairly comfortable. I also liked that we wouldn’t have to do the driving, we would learn more about the area from our tour leader, and I wouldn’t have to research where to stay at the various National Parks. Another major bonus is that we got to know people from all around the world. Our fellow travelers hailed from the United Kingdom, Canada, Australia, New Zealand, Spain, and the USA. There were no other kids on this particular trip, and only one other male besides my husband. My husband and kids didn’t mind though! Our first stop was Zion National Park. The Park was really beautiful and had the most greenery out of all the parks we visited. It reminded me of Yosemite National Park, but with red rocks instead of grey. We did the Riverside Walk, a 2.2 mile (3.5 km) hike which follows the Virgin River along a narrow canyon. While it took awhile for the girls to get going, they both completed the hike. The highlight for them was putting their feet in the river and coming across a mule deer. 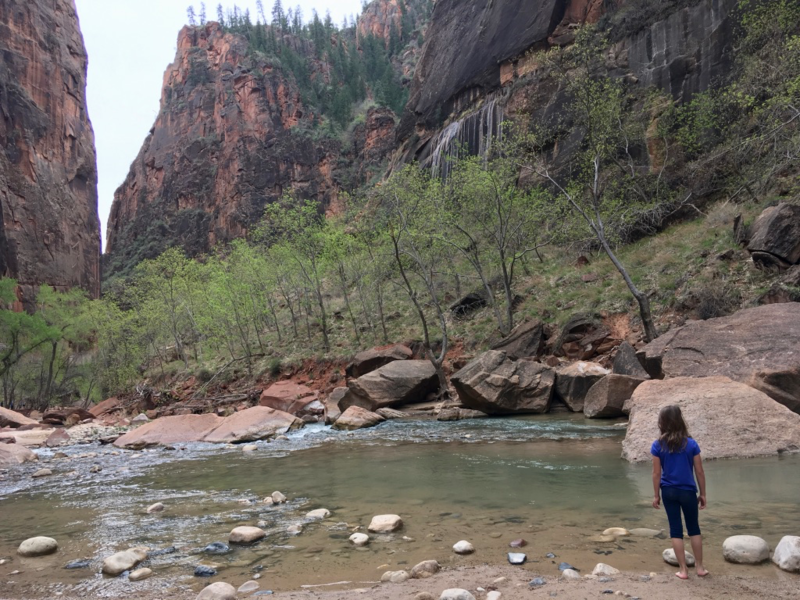 Amy dipping her toes in the Virgin River at Zion National Park, Utah. The water was cold! I also did part of The Grotto trail, but got confused when the trail seemed to end at a building, and not a grotto. It turns out that the building was the home of the Artist in Residence. If I had kept going, I would have made it to the grotto. I had actually intended to go on the Lower Emerald Pool trail, but didn’t realize it started on the opposite side from where the bus dropped you off. That evening we set up camp along a river just outside the Park. We had a campfire that night and got to make s’mores, which the girls loved! It turned out that that was our only campfire of the trip because of the windy conditions at the other campgrounds. The next morning, I came back to do some more hiking while my girls and husband slept in at camp. A fellow camper and I did part of the Angel’s Landing trail and the Pa’rus trail. The full Angel’s Landing trail is a 4 hour trek, and a few of the campers got up really early to do it. It is not recommended for children because it is quite steep and can be narrow and slick in parts. The high elevation makes it challenging to breathe, even for us adults. 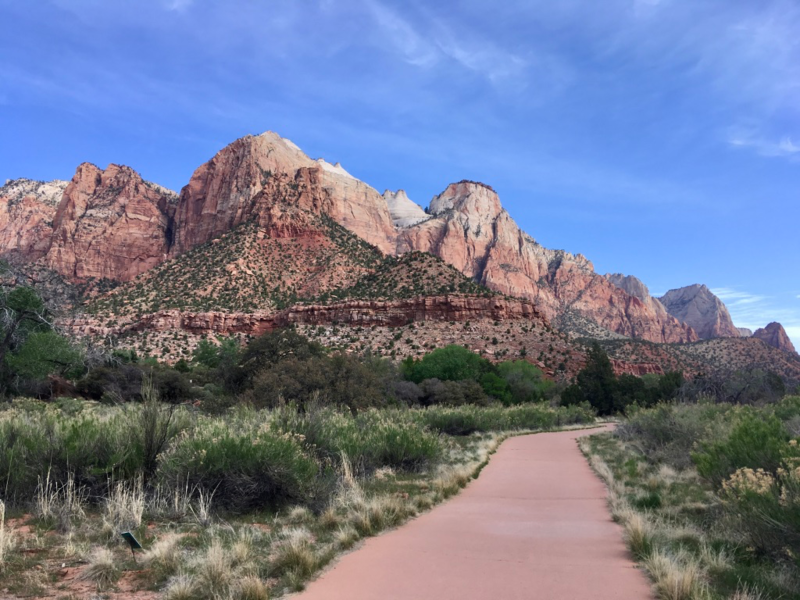 The Pa’rus trail, in contrast, is a paved leisurely trail that follows the Virgin River from the South Campgrounds to Canyon Junction (Stop 1 to Stop 3 on the bus route). Our tour leader was meeting us at Stop 2, but we were so busy walking/talking that we didn’t notice we walked right passed the turnoff for Stop 2 and walked all the way to Stop 1! The tour leader had to drive the first set of campers back to camp so they could start taking down the tents, then he came back to get us! It was quite the adventure! On our way out of the park we passed some Great Horn Sheep grazing on the rocks. To learn more about Zion National Park and it’s trails, click here. Bryce Canyon National Park has the largest collection of hoodoos (odd-shaped pillars of rock) in the world! The colors of the rock are spectacular! Most people come for a day and a lot of the hiking is concentrated in the Bryce Canyon Amphitheater. We took the Sunset Point to Sunrise Point hike, which is about a 2.2 mile (3.3km) hike. The main thing to know is that the trail is steep going down and coming back up. 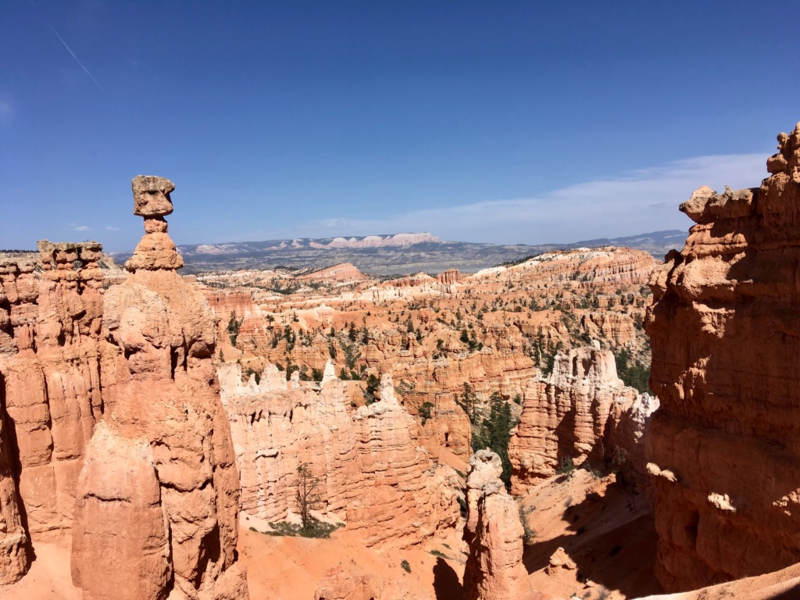 Bryce Canyon is at a high elevation (7,894ft/2406m at the North Campground), so the lack of oxygen in the air adds to the challenge. It can also get quite windy and we had to protect our eyes from the blowing sand. For a map of the whole park, click here, and for a map just of the Amphitheater, click here. The next day, as we were leaving the Bryce Canyon area, it actually started snowing! Little did we know that that wouldn’t be our only encounter with snow on the trip! I had no idea that the it even snowed in the Southwest USA! We didn’t expect to see snow in Utah! Arches National Park has over 2,000 natural stone arches, though we only saw a handful of them. It also has many other rock formations such as pinnacles, fins, and giant balanced rocks. While the sun was out at the Park when we were there, it was still quite windy. The four of us did the Park Avenue hike, which is a 1 mile (1.6km) hike. I also did the Windows trail, another 1 mile (1.6km) hike, while my husband Anthony did the Delicate Arch (3 miles / 4.8km) hike. The girls stayed in the bus with another camper who had twisted her ankle. Our tour leader took those of us who didn’t do the Delicate Arch hike back to the campground first to start setting up camp. He then returned with those who had done the Delicate Arch hike. 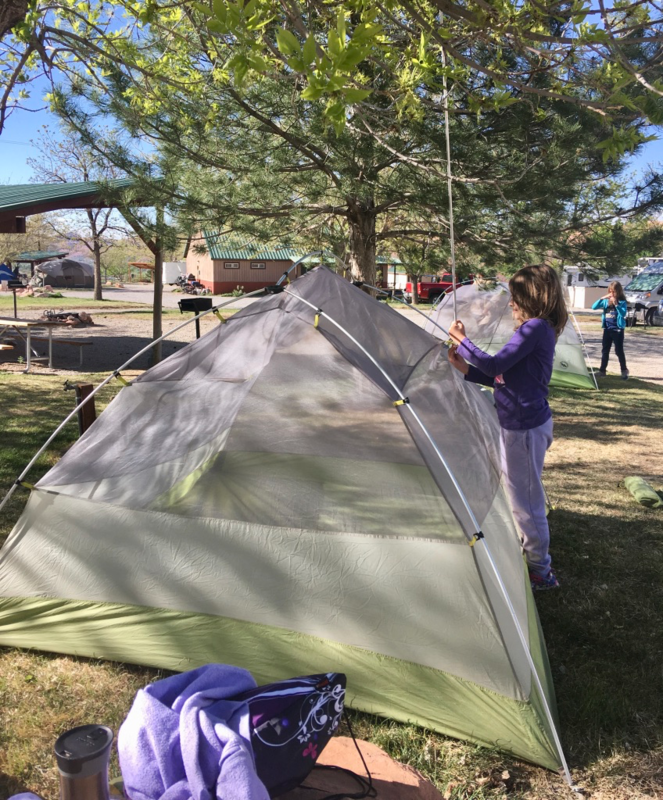 We stayed at a campground in Moab, and were very happy to have a patch of grass on which to pitch the tents! We stayed at this campground for 2 nights. It was a luxury not to have to pack up the tent the next morning! 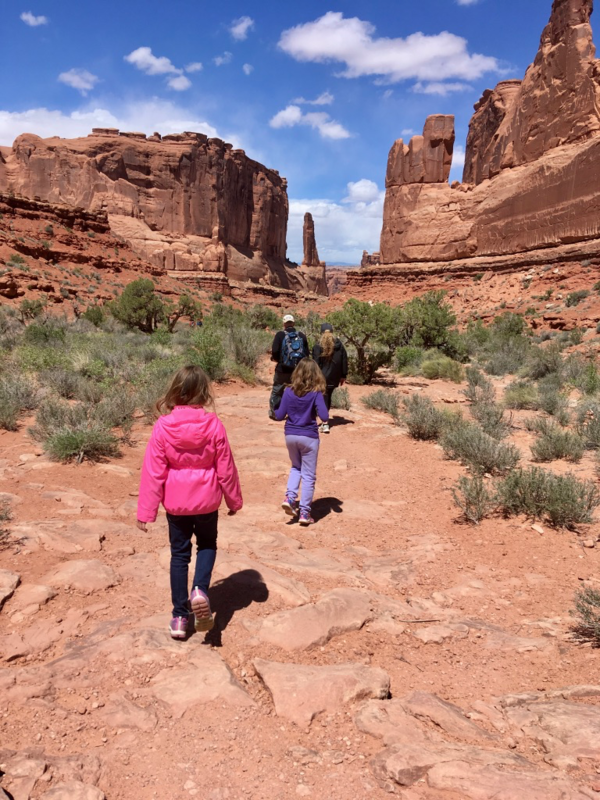 For a complete list of the hiking trails in Arches National Park, click here. The next morning we went to Canyonlands National Park.The Park is divided into three Districts (Island in the Sky, The Maze, and The Needles), though there are no roads which connect the Districts. This is why we didn’t do a lot of hiking here, except for a short hike to the Mesa Arch (0.5mile/0.8km). We stopped by the Visitor’s Center and had spectacular views from Mesa Arch and Grandview Point Overlook. The Park also has two rivers which cut through it – the Colorado and Green Rivers, along with river activities. To see a map of the park and a list of hikes, access the Visitor’s Guide here. 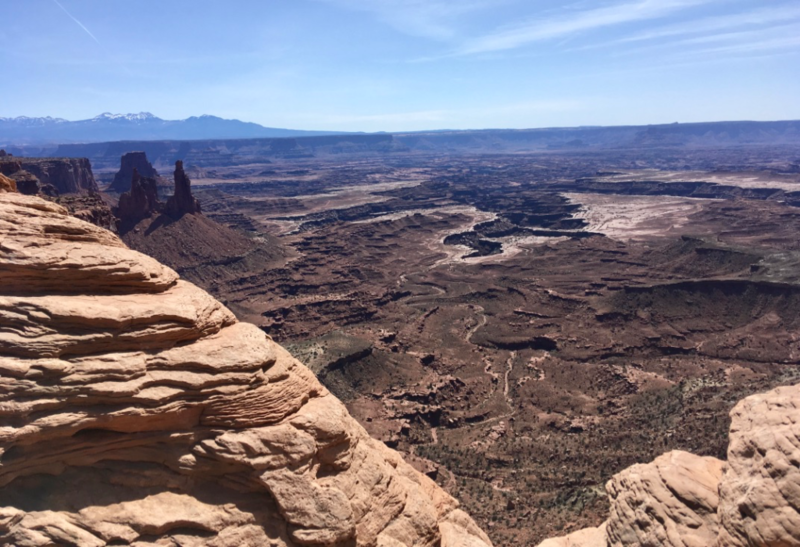 View of Canyonlands National Park from the Mesa Arch. We had the afternoon free to do some optional activities in Moab. Most of us, except my husband and girls, opted to do the Slick Rock Hummer tour. We took a 12-seat Hummer on the Hell’s Revenge 4×4 trail in the Sand Flats Recreation Area. It was a lot of fun! This area has spectacular views and dinosaur fossils! That evening our tour leader took us into town. All of us opted to have dinner in town, instead of at the campground. We split up and explored the downtown area on our own. The girls picked out stuffed rattlesnakes as their souvenirs. The evenings at the campground were still quite cool, but this time the tour leader gave each tent an extra sleeping bag to help keep us warm. The next day we headed to Monument Valley, stopping at the Butler Wash Ruins Overlook. It’s a short hike from the parking lot to get to the ruins. 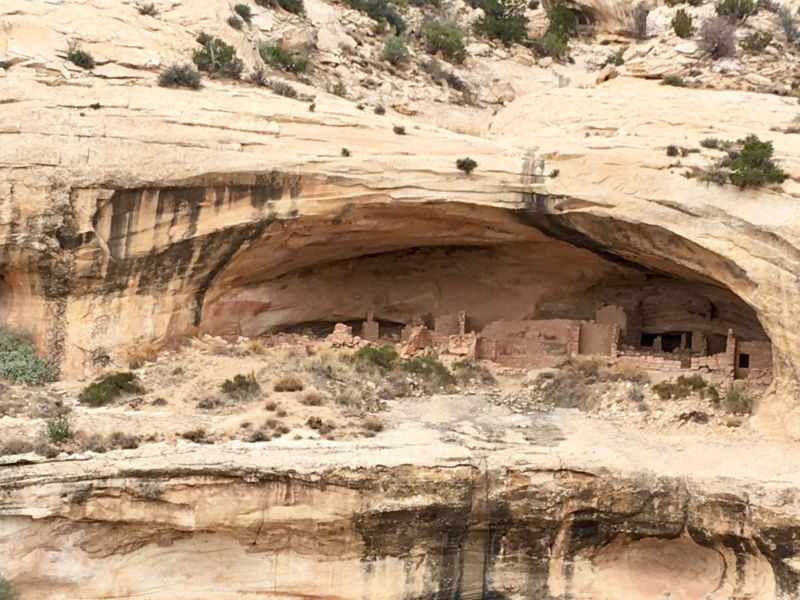 According to the Bureau of Land Management, Butler Wash Ruin is a cliff dwelling that was built and occupied by the Ancestral Puebloans, sometimes known as Anasazi, in about 1200 AD. Parts of the site have been stabilized and reconstructed, but most of it remains as it was found in the 1800s. After seeing the ruins, we continued onto Monument Valley. Monument Valley is on the Arizona/Utah border and is part of the Navajo Tribal Lands. It is known for its stunning red sandstone buttes (an isolated hill with steep sides and a flat top) and for being the location where many iconic Western movies were filmed. We set up camp right in the valley, with beautiful views of the Eastern Mitten and the Western Mitten buttes. It was quite windy and that night there was a sand storm, so we had a good layer of red sand all over everything in the tent! 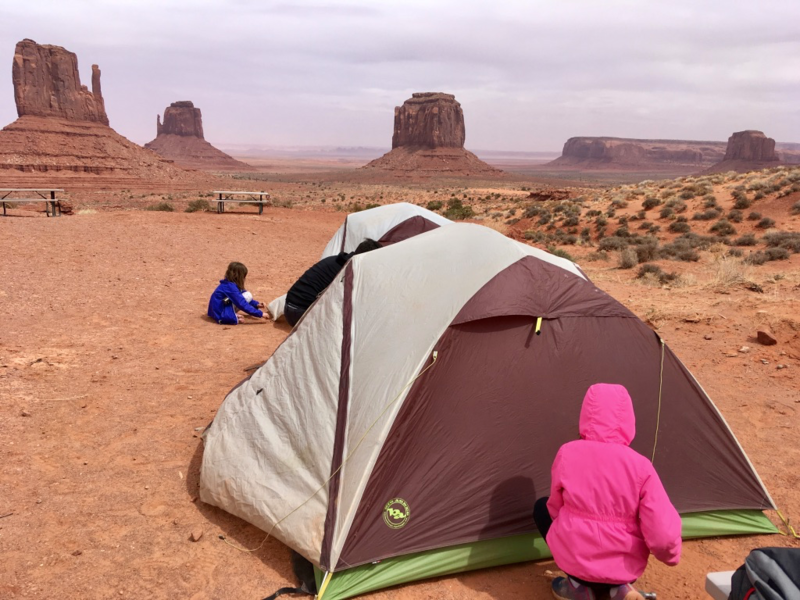 Setting up the tents in Monument Valley, with views of the East Mitten and West Mitten buttes in the background. 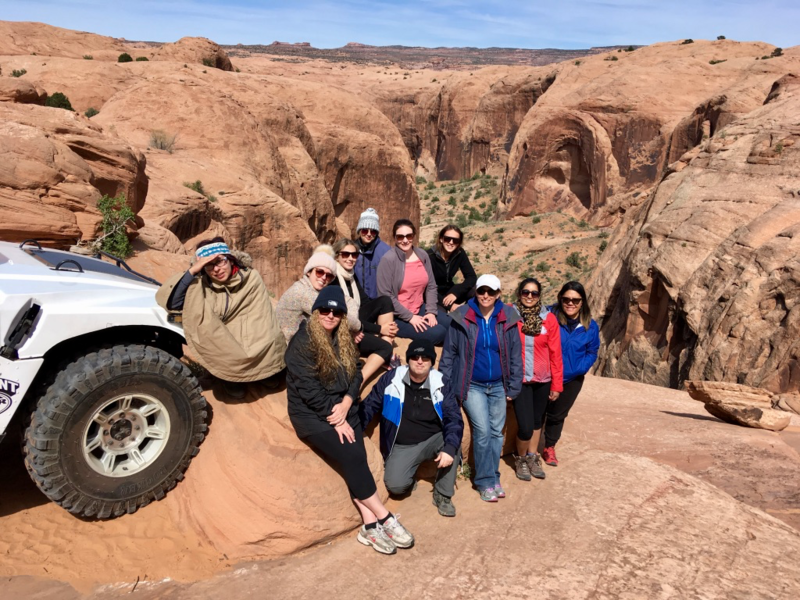 Our group took an open-air jeep tour of the Valley, with a Navajo guide. He explained the names of various places, and even sang a couple of songs for us and told us a Navajo story. That night, we went to the house of another Navajo, named Sheila, for a Navajo taco dinner. It was delicious! We got up bright and early the next morning to watch the sunrise over the Valley. We also got to see one of Sheila’s dogs chase a wild horse through the campgrounds! That was quite the site! After Monument Valley, we started our drive toward Grand Canyon National Park. 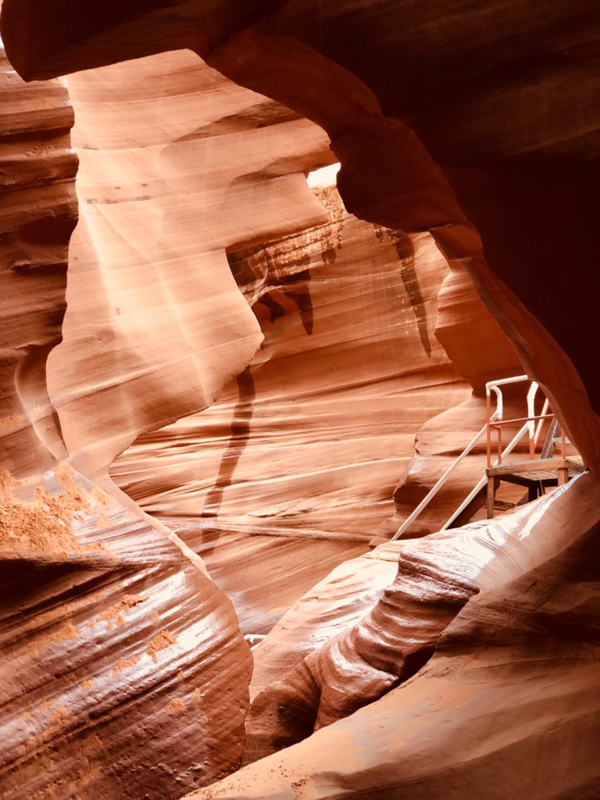 We stopped to hike into Lower Antelope Canyon in LeChee, Arizona, also part of the Navajo land. Our tour leader got us there just in time to catch one of the last tours before it was closed due to rains. The girls didn’t want to hike in the rain, so I stayed in the bus with them. Anthony went on the hike and captured some spectacular pictures to share with us. 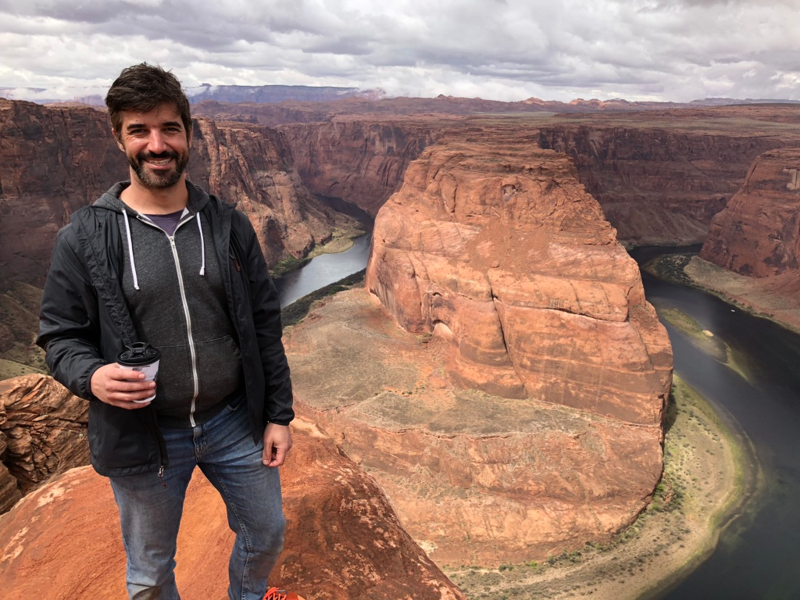 Our next stop was at Horseshoe Bend. This is where the Colorado River bends through Glen Canyon, before reaching the Grand Canyon. The girls and I stayed in the bus for this one too, even though it wasn’t far to the Vista Point. In retrospect, we probably should have gone as this is one place where you can get a good view of the Colorado River (it’s hard to see from the Grand Canyon unless you go down right into the Canyon). 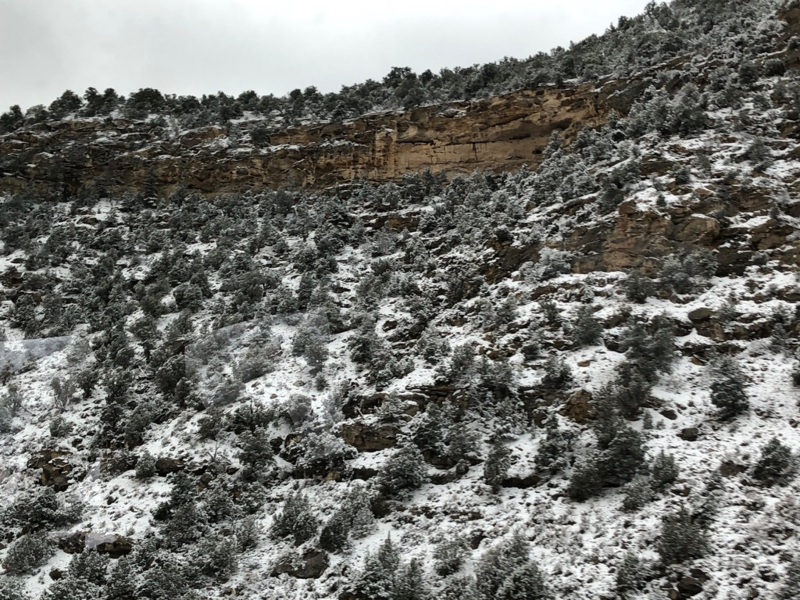 After stopping for lunch in Cameron, Arizona, we continued on towards Grand Canyon National Park and as we did the rain started turning into snow! As we entered Grand Canyon National Park, we could literally see nothing but white clouds and snow all around us! We hung out at the Bright Angel restaurant and gift shop until the clouds broke enough for us to catch a glimpse of the Grand Canyon. Since the evening was going to be quite chilly, all of us opted for a hotel room that night. After checking-in, we headed back to the Park at sunset and were rewarded with glowing views of the Canyon. Anthony returned the next morning to catch the sunrise, while the girls and I stayed snug in our nice warm beds. The tour leader took the whole group back to the South Rim part of the Grand Canyon National Park later that morning. We walked 2.6 miles (4.2 km) along the Rim Trail from Mather Point to the Bright Angel Trailhead. Part of this Trail included an exhibit called ‘Trail of Time’. Along the trail were stones from different time periods, including some from thousands of years ago. We also had time to check out the Yavapai Geology Museum and the Hopi House (a National Historic Monument). At the park we saw elk, squirrels, and chipmunks. Although the trail was actually a paved path, it was still a bit challenging for the girls because of the high elevation. They did it though and were rewarded with an ice cream at the end of the walk. One squirrel really wanted Hannah to share her ice cream with him! Our tour group reconvened for one last lunch of wraps and deli sandwiches before starting the drive back to Las Vegas. We took this tour in part because it coincided with our girls’ Spring Break. It retrospect, April is still a bit chilly to be camping. I had no idea that it snowed in the Southwest USA! 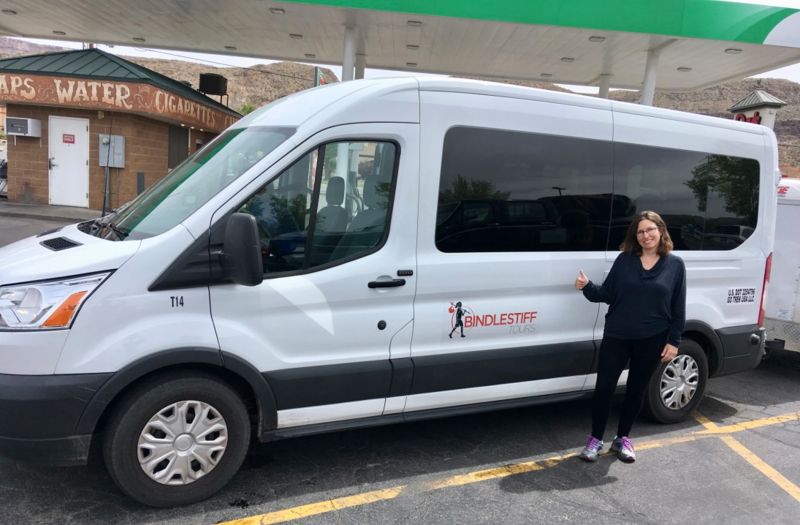 Bindlestiff Tours offers a hotel version of the same tour. I thought the camping was a great experience for us, but definitely recommend being prepared for the chilly evenings if you opt for one of the earlier camping tours. The other thing to note is that the air is extremely dry in Utah and Arizona, so bring lots of hand and face lotion with you and make sure it has sun protection in it. Overall, I recommend the tour. It’s a great way to see several National Parks in a short amount of time. I didn’t feel rushed on the tour and felt we still had enough time to do some great hikes. There is a 3 day tour but it offers less flexibility than the 7 day one. Even though there were no other kids on our tour week, it is definitely appropriate for kids. The recommended age is 7 and up. You’re likely to find other families on the tour in the summer weeks. If you have any questions about the tour, please ask me in the comments section, or send me a direct message through the Nature Adventurers Facebook page or through Twitter (@RTWNatureTravel). very interesting and detailed article. thanks for the given information.